The vocation of the Scientific and Technical Information (STI) service is to provide staff and members of the LAAS as well as Club Affiliates genuine access to information. 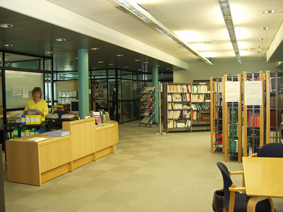 The library includes a reference works funds, collections of scientific journals, the publications fund of the laboratory, documents obtained through the inter-library loan and other documents such as research reports and theses. These funds are managed electronically and accessible from any computer workstation in the laboratory. Access to information via databases and databases of commercial servers via Internet services. Management and dissemination of publications of the laboratory. They are promoted by disseminating lists in paper form and via a server on the Internet. Collaboration with libraries and documentation centers: inter-library loan, document exchanges. The Scientific and Technical Information Service-Publishing (STI-PUB) is organized to facilitate the researcher's work, information and consumer information producer. In-built premises in 1995, 450 m2 were assigned to a new library where you can find a fund of 8000 works (which should be enriched by 300 volumes/year) and a collection of 500 journals subscriptions, some dating back to the creation laboratory. In addition some 15,000 books are distributed throughout the lab. The service is responsible for obtaining all documents reported in databases not available in libraries (purchases, loans or exchanges between libraries). CNRS has a direction of scientific and technical information, DIST, which brings together policy STI CNRS. An integrated printing with copying, color printers and finishing equipment allows the reproduction of all the productions of the laboratory. The service is open, under certain conditions, to other laboratories. Contact: Dominique Daurat, Building E, room E15 as 05 61 33 69 81.